Alice Jno Jules, the president of the Dominica Netball Association was desperate. She needed money urgently to kick off the 2013 netball league and there was none. She called Big Edge. "Those of us who know Alice Jno Jules know her as a very cool person but that day she was very hysterical and I recognised that she was in a desperate situation", said Billy Doctrove proprietor of Big Edge. "We thought it would be a good idea to be associated with the Dominica Netball Association". 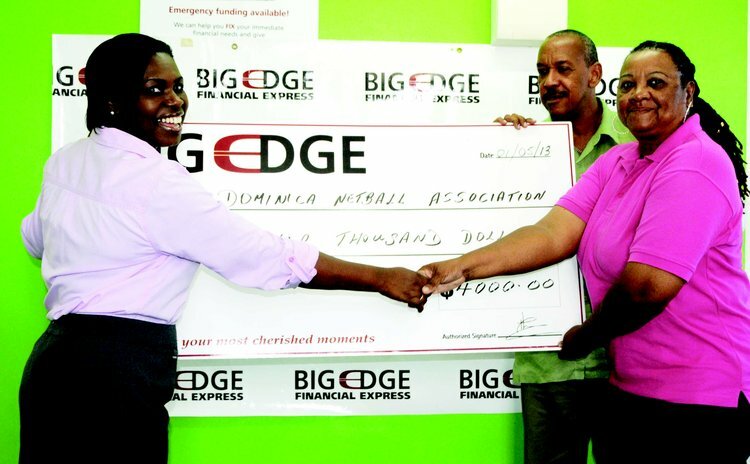 At a simple ceremony at Big Edge's office on Hillsborough Street last Wednesday, the company presented Jno Jules with a cheque of EC$4000 to help run a national league that started two weeks ago. "Netball as you know is in the doldrums and we would like to assist the Dominica Netball Association to try and bring it back to what it was," Doctrove said. "Years ago Dominica was foremost in Caribbean netball; we were a very strong team but over the years we have found ourselves on the back- burner. Netball, for some reason, has not been able to get the support that it needs." Doctrove encouraged the teams in the competition to play hard, to celebrate victories and to lose with dignity and pride. "And try and respect the officials of the game," said Doctrove, a retired ICC Elite Cricket Umpire. "The officials have a very difficult task, so please respect the officials and play the game in the proper spirit."